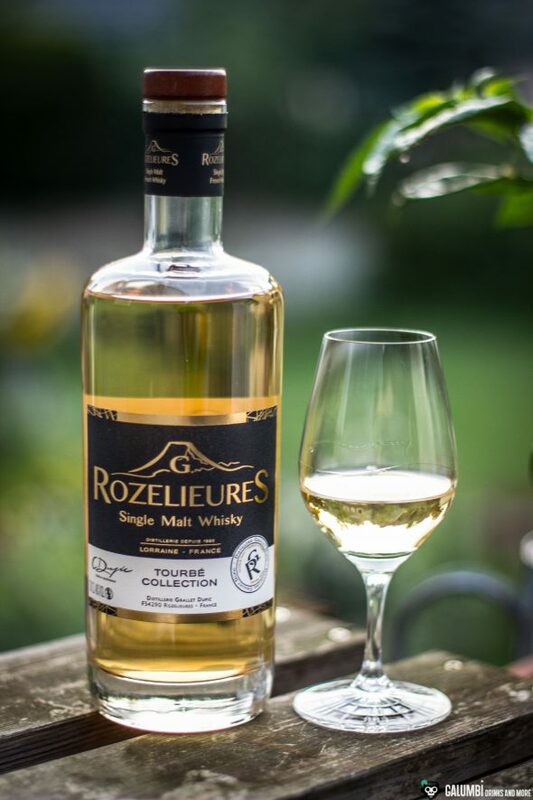 The G. Rozelieures Fumé – the name does already suggest it – is smokier compared to the Origine and the Rare Collection. With about 20 ppm, the smoke can both be scented and tasted more clearly here, even though we are still a long way from the big smokers of the Scottish Hebridean island of Islay. It was allowed to mature for 8 years in former sherry casks; former Fino sherry casks to be precise. The fino-sherry is closely related to the Amontillado and is a dry and bright representative of its genre, but the sherry influence is nonetheless also reflected in a darker color compared to the Tourbé. 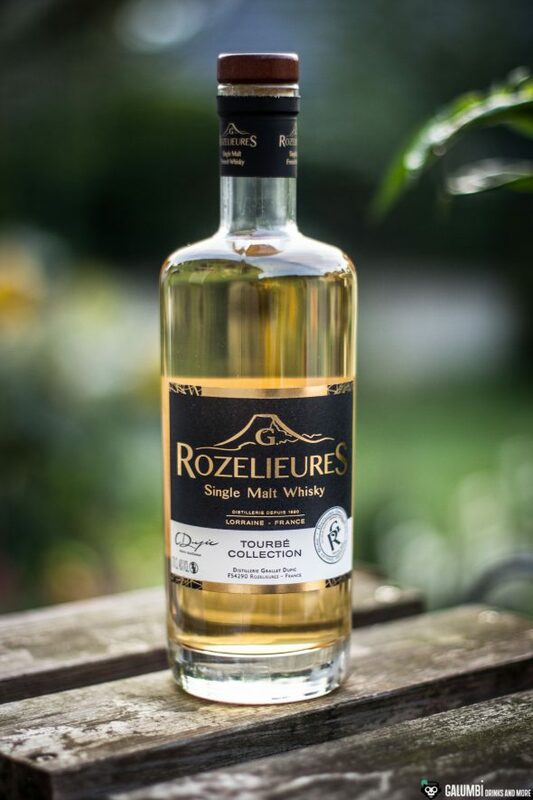 The G. Rozelieures Fumé Collection Single Malt Whiskey is bottled with 46% ABV. It costs about 55 euros. Aroma: On the nose it is clearly recognizable as a sherry-matured Single Malt. Winey notes combine with various bright fruits, malt, some chocolate and subtle honey. Then there are some campfire smoke and some nuts, but the smoke is gentler than I would have expected. A very appealing smell if you ask me! I am almost inclined to call this one my current favorite among the G. Rozelieures whiskys. Taste: On the palate, again, the notes of fino-sherry casks are obvious and finely combine with fruit aromas (which tend more towards the citrus spectrum). Again there are malt, nuts and an aromatic, medium-strong smoke. Also some cacao can be found again and it unites with some oak and spices, thus creating a beautiful impression. A nice Single Malt! Finish: dry with smoke, malt and sherry. Medium-long. The smokiest representative of the series is the G. Rozelieures Tourbé Collection. Tourbé means “peated” and the manufacturer speaks of about 30 ppm, so you can expect quite a smokiness. The cask maturation has been a classic one in former bourbon casks for a period of 8 years. Finally, however, it is “finished” in new Lorraine oak casks. This one is also bottled at 46% ABV. A bottle costs about 65 euros. Aroma: The Tourbé does not offer the same intensity of smoke as the famous smoke bombs from Scotland do. But it does not have to! 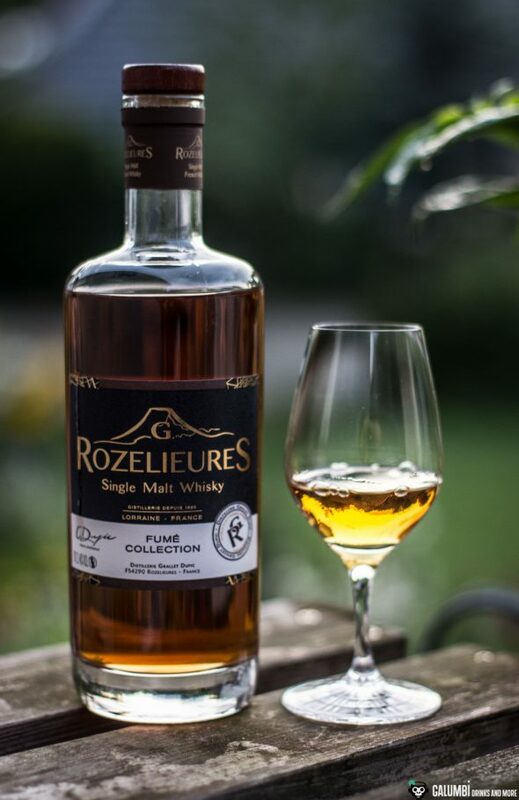 It is true that the smoke here is doubtlessly the most intense among the G. Rozelieures whiskys, but it is still relatively easy to recognize the bourbon cask influences: vanilla, oak, spices and a hint of caramel are accompanied by a spicy smoke all of the time. After a while there are associations of lemon peels and some heather. Taste: On the palate you can also feel the expected duet of smoke and barrel: The smoke harmonizes very nicely with vanilla, oak and subtle honey. Fine spices remain on the taste buds and after some time they offer some caramel and a touch of chocolate. Finish: Here, too, smoke, spicy oak and a nice vanilla remain. Long to medium-long. To use smoky whiskys in cocktails is definitely a great thing, always exciting, but also always a challenge. 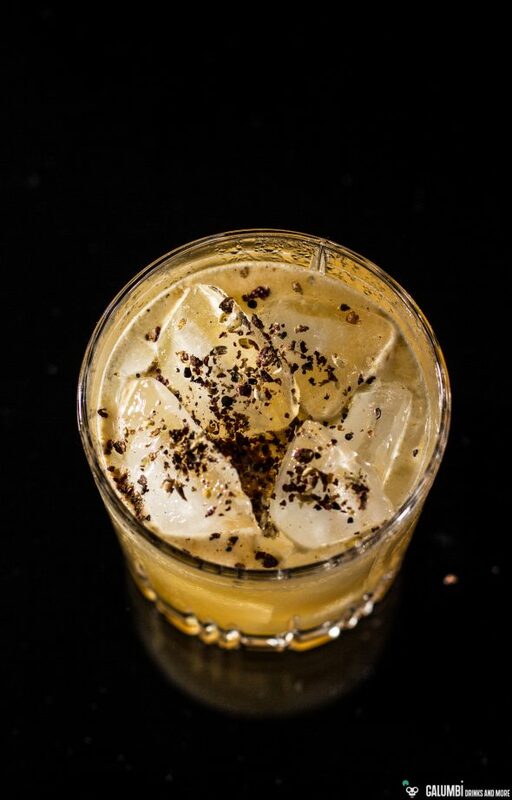 It is not by chance that the number of internationally renowned cocktails made with smoky Scotch is not very huge. So today I decided to go for a twist on a modern classic which I liked very much. 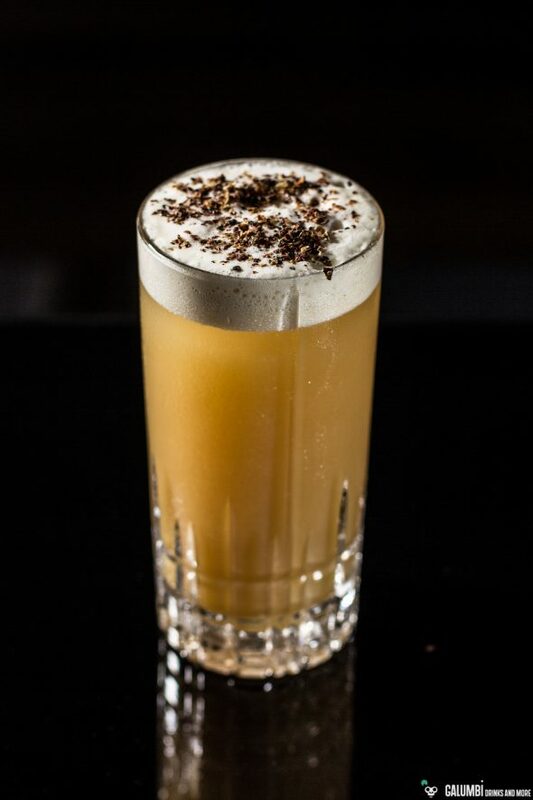 My Fizzing Penicillin is, you can guess, a variation of the Penicillin cocktail that has meanwhile become a modern classic. 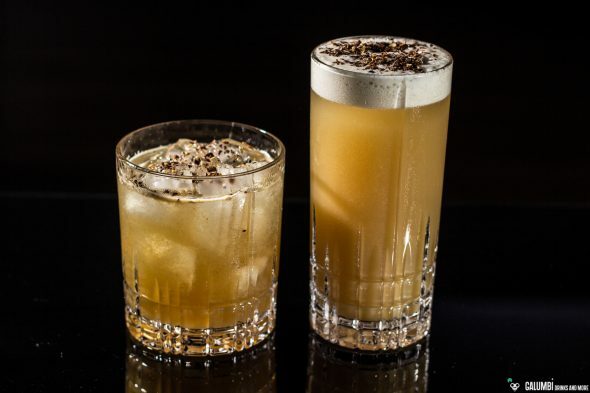 Sam Ross invented the Penicillin cocktail in New York in 2005, creating a drink that shows the quality of subtly used smoky scotch. In his original recipe, however, the smoky whisky plays only a secondary role, since it is mainly responsible for an intriguing interplay of smell and taste. 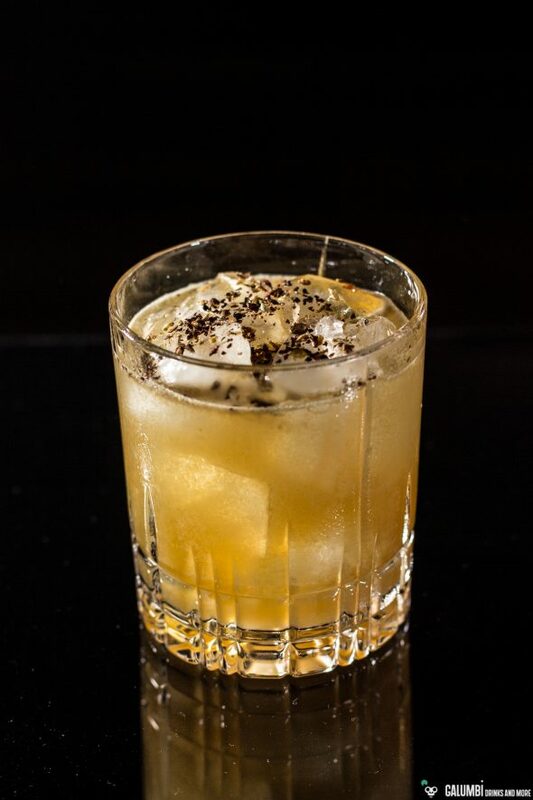 Ultimately, however, it was a variation of the Penicillin cocktail that brought me to the Fizzing Penicillin and which I – Sam Ross may forgive me – even like a little bit more than the original. 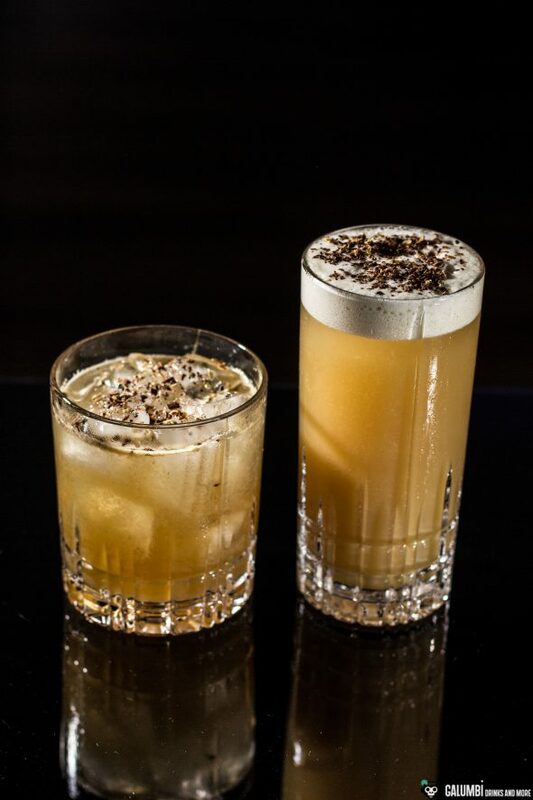 I am talking about the Penicillin cocktail by Oliver Ebert from the Becketts Kopf in Berlin. I first came upon this variant through a 2013 Mixology article and regularly mix it for myself since then (and especially for my wife, who really loves the drink). What is special about Ebert’s version is the clearly stronger smoke note of the drink since he completely relies on smoky Scotch. In Ebert’s drink, therefore even smokier whiskeys can be used than the G. Rozelieures Tourbé, but I find that this is a very nice whisky of medium smoky intensity and therefore cuts an excellent figure in Ebert’s Penicillin. Smoky single malt, the beautiful Galangal liqueur of the Preußische Spirituosen Manufaktur, forest honey (which I like to heat in a pan before using it – it makes it more liquid and easier to use) and lime juice form the quartet of ingredients for the Berlin Penicillin cocktail. For the Fizzing Penicillin, I mainly stuck to Ebert’s version but in a way it is a more summery variation. 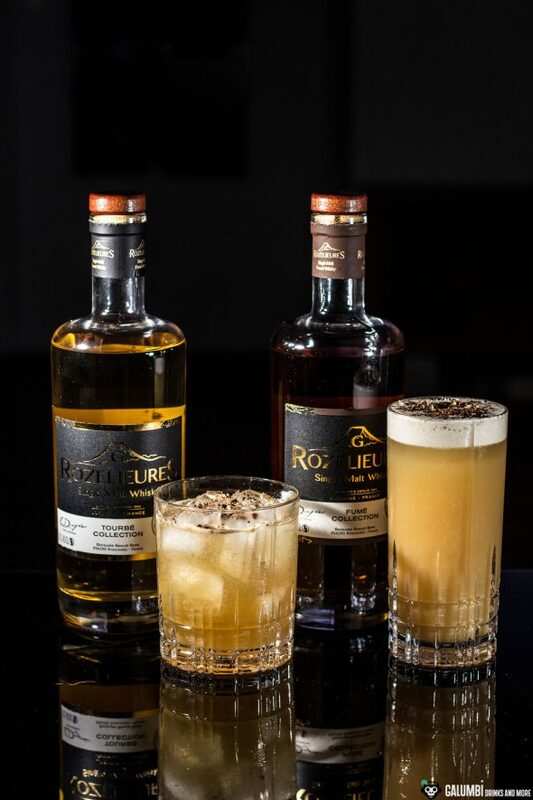 The G. Rozelieures Fumé weakens the smoke character of the cocktail compared to the original, but together with an idea of freshly made nectarine juice (from the juicer) and two dashes of the Bittermens Hellfire Habanero Shrub the drink gains a very interesting note. It is made in the style of a silver fizz with egg white and soda water. Definitely a Fizz which stands out from its siblings. For the sake of completeness, I will also list Sam Ross’s Penicillin recipe. Honey-ginger syrup: Add 4.5 cl of liquid honey, 4.5 cl of freshly squeezed ginger juice, 1.5 cl of water and two tablespoons of sugar into a pan and slowly bring to the boil. Once the honey and the sugar have dissolved, remove from the heat and allow to cool. Preparation: Shake all the ingredients vigorously on ice and strain into your glass filled with fresh ice cubes. Preparation: Heat the honey in a pan until it turns a little bite more liquid. Then add together with the remaining ingredients into an ice-filled shaker and shake vigorously. Pour into a glass filled with fresh ice cubes. Preparation: Heat the honey in a pan until it turns more liquid, allow to cool a little bit. Then add it to your shaker together with the remaining ingredients except for the soda water. First, do a “dry shake” without ice (or froth it with a milk frother). Finally, shake vigorously on ice and double-strain into a pre-chilled glass (do not put ice in the glass!). Top off with soda water and stir. Be careful not to overspill the foam. Finally add one spray of Laphroaig 10 years from the vaporizer on top of the drink and garnish.